A Luxury Escape: Top five.. 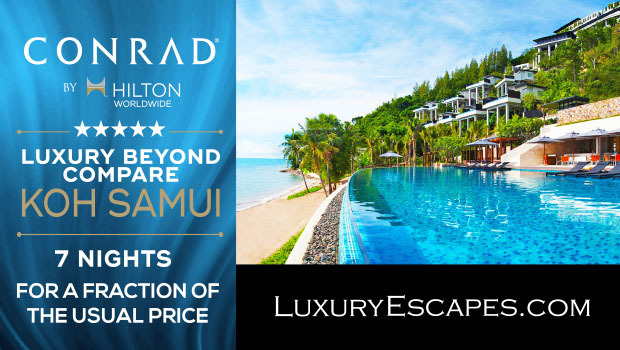 Indulgence awaits in Koh Samui – Experience luxury beyond compare. If you want to ‘get away from it all‘ then escape to Thailand’s Koh Samui. It’s a lot less crowded, and less crazy partying tourists. You’ll find pristine waters and clean white beaches and fabulous luxury hotels. If you are dying for a relaxing, luxurious holiday and don’t want to travel too far, or pay through the nose, then this is the place for you. Be it on it, under it, snorkelling it, you cannot come to Koh Samui and not take in the stunning water. Ang Thong National Marine Park is a pristine archipelago of 42 islands in the Gulf of Thailand with towering limestone mountains, thick jungle, white-sand beaches, fertile mangroves, waterfalls and hidden coves and lakes to explore. Within sight of Koh Samui, Ang Thong park is a protected area of more than 100 square kilometres of land and sea, and home to a rich variety of exotic wildlife and sea creatures. Snorkelling, hiking, sea kayaking, diving, sailing and simply relaxing on one of its idyllic beaches are the main activities to enjoy. Beach clubs and beachfront bars & restaurants abound on Koh Samui, which remains among the favourite holiday destinations in Thailand. Beach dining is certainly the most popular activity of any vacationer visiting the island, as it is relaxing and gives a sensation of privilege to enjoy delicious food and drink with your feet in the sand. 3. Fly high with zip-lining! Samui has long been known for its lovely beaches, warm water and countless coconut trees but there’s more to the island than that. We are talking about flying over Samui’s tropical jungle on cable rides on a zip-line adventure. The amazing bird’s eye views of this lush rainforest and its surroundings are truly memorable. Zipping along from line to line and pretending to be a modern-day Jane or Tarzan is a perfect and unique way to complement your Samui stay. Thai cuisine has always been popular here in Australia and is even more delicious eaten on native land. You simply cannot stay in Thailand without taking a fun cooking class. It’s a great way to mingle with locals, take in the culture and learn about different types of food and tastes. Most good hotels offer daily cooking classes. Very yummy. If all of the beauty, food and ample activities haven’t managed to wind you down into holiday mode, then you absolutely must have a traditional Thai massage. This is my favourite type of massage. It’s great for stretching out your muscles and really getting you into your holiday. In Thailand, traditional massages are cheap and available everywhere; and most places (even the ones on the beaches) are really good.